The boss of British Gas has warned that energy bill rises are ‘inevitable’ – and the Government’s green policies are to blame. Chairman of Centrica, Sir Roger Carr, advised that further gas and electricity increases could not be avoided as the UK Government continues to push through its ‘decarbonisation’ agenda. 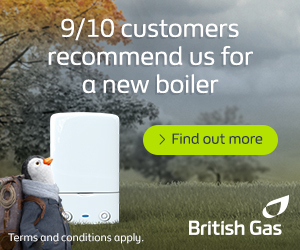 Centrica is the parent company of British Gas, which supplies energy to millions of homes throughout the UK. Carr noted: “Ofgem [the UK’s energy regulator and price watchdog] has said that it would see over the next decade a dual fee bill going up by £500 a year for a typical consumer and that’s related to decarbonisation rather than market forces”. The Chairman’s comments are unlikely to sit well with those who voted for the ‘greenest ever’ Government, which has, so far at least, failed to reach its carbon emission targets. The coalition also has been criticised for opting to reduce funding for many energy saving schemes and initiatives, leaving voters unsure as to why they are being asked to pay more for less. Energy Secretary Chris Huhne advised customers to ‘vote with their feet’ by urging people to switch suppliers. Mr Huhne said: “Consumers don’t have to take price increases lying down. If an energy company hits you with a price increase, you can hit them back where it hurts – by shopping around”. Perhaps Mr Huhne is unaware that the toothless Ofgem has been unsuccessful in ensuring that the UK’s big six suppliers offer competitive prices to consumers; indeed, when one energy firm raises its prices, the remaining five are not far behind. The Consumer Focus’ Adam Scorer reiterated the point by stating: “You can incite customers to switch all you want but there is nowhere for them to go. It is too difficult for operators outside the ‘big six’ to enter the market and only Chris Huhne or the regulator Ofgem can refer them to the Competition Commission, which so far he has failed to do”. Householders in the UK can help to reduce their energy bills by employing various energy saving measures throughout the home. Replacing old central heatingboilers, installing cavity wall insulation and fitting solar PV panels to the home can help to save or generate energy. PREVIOUS POST Is Now the Time to Switch to a Fixed Energy Tariff? Good posting to see what’s happening overseas! It is so true that so many adjustments to energy consumption can be made by simple alterations such as better insulation.